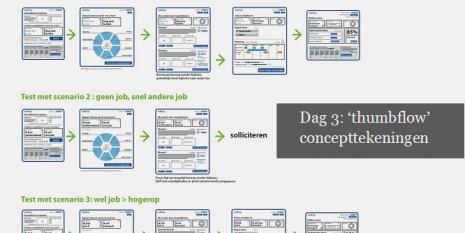 An intensive design-in-a-week co-design and the resulting interactive prototype enabled the Flemish Service for Employment and Vocational Training to explore some of the key concepts of a valuable career planning service. New European legislation requires that every EU country provides each of its citizens with the possibility of making a Personal Career Development Plan. VDAB, the Flemish Service for Employment and Vocational Training, asked Namahn to make a first prototype of the user interface in order to clarify some of its concepts and to study its practical feasibility. Through user interviews with both citizens and employment counsellors, we discovered that users wanted quick results with the minimum number of steps and to be presented with information that they didn’t already know. The tool should also take into account citizens’ different interests, physical limitations, family situations, work-life balance, mobility and learning styles. In addition, contact with those in similar circumstances was valued. During the intensive design-in-a-week co-design period, we used wireflows: small mock-ups of design ideas. They enabled us to follow a rapid prototyping and iterative design process optimised for user testing. The final interactive prototype for the career planning portal was the perfect tool to test the practical feasibility and capture real-life user needs. The six personas developed and tested with partners of the VDAB were found to be highly accurate.